Bishop Bruté Days, a retreat and camping experience for junior high and high school-aged boys sponsored by the Bishop Simon Bruté College Seminary in Indianapolis, just keeps growing and growing. 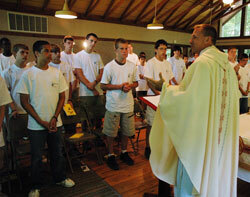 In its initial year in 2006, some 18 young men from across the archdiocese participated in the priestly vocations camp. Last year, that number ballooned to 52 boys. This year, the event, which will take place on June 11-14 at the Future Farmers of America Center near Trafalgar, is expected to have another great turnout. With that growth in mind, Father Robert Robeson, rector of the seminary, said there will be separate tracks for Bishop Bruté Days, one for boys in grades seven and eight, and another for boys in ninth grade through 11th grade. High school seniors who sign up for Bishop Bruté Days will be assistant counselors during the event. Bishop Bruté Days is designed for young men who are open to the idea that God might be calling them to the priesthood. It will include daily Mass, eucharistic adoration, praying of the Liturgy of the Hours and the rosary, opportunities for confession, and presentations on various aspects of faith given by priests and seminarians. In addition to these faith-centered activities, the camp will also include various outdoor activities, such as basketball, football, canoeing and swimming. Kyle Field, a homeschooled high school senior who is a member of St. John the Apostle Parish in Bloomington, will be an assistant camp counselor. He participated in the first two Bishop Bruté Days. From his experience, the outdoor activities paved the way for a more profound experience of prayer at the camp. Seminarian Daniel Bedel, a member of St. John the Evangelist Parish in Enochsburg in the Batesville Deanery, will be a junior at Bishop Bruté College Seminary next fall. As one of this year’s leaders at Bishop Bruté Days, he thinks the camp can be very helpful for young men who might be starting to think about the priesthood. Young men who might be thinking about the priesthood will also be able to interact with archdiocesan seminarians, some of them not many years older than themselves.